"The opener was awesome," race director Stephanie Russ Penn said. "We had over 260 persons for the start of the race, the atmosphere was alive, people were buzzing, warmup and preparing and the event itself went really well. Overall race winner and defending champ Reuben Stoby, said he just wanted to run his own race. "You never know who's going to show up in a particular race as you have a lot of the 800/1500m runners who tend to come out," he noted, after finishing in 11 minutes and 24.1 seconds. "So, I just wanted to run within myself and I was able to maintain that pace. I think a lot of the runners would have gone out too fast and they faded, so I just continued. "Stoby said he was surprised that he wasn't challenged. "I made a move just on the climb-it wasn't much of a surge-I was thinking someone would come with me and see if I could continue to press, but, no one came and I maintained the pace and won comfortably." Defending Women's Division champion Rosmond Johnson was the first across the line, much to her surprise. "To be honest, I'm not the fittest person right now," she noted after running 15:05.3. "I haven't been running a lot these days, so I'm a little surprised as I went out really hard and when I got to the middle of the incline I felt tired, so I walked for a couple seconds then ran again. I ran, ran, ran again, stopped-I think I stopped about five times in the race-but I made it and I'm surprised I'm the first lady. I feel good about myself. 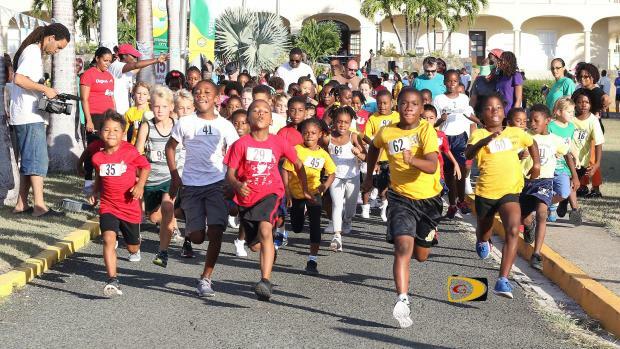 Joyce Samuel Primary School Principal Olandette Crabbe was happy with the turnout of students many of whom competed in the One Mile and parents in particular. "From the first week of school, we told the children about the event and they haven't let us forget about it and they've been reminding about it," she said, noting many were in the One Mile. "We had a sign up sheet and both sheets were full so e actually expected more children this morning but we are pleased with the turnout and we are especially pleased with the parents. This is the first year that we have more than one PTA team. We have at least 12 parents present this morning. We thank them for coming out and we want to see them in the other three races." Penn said since the U11s were added to the One Mile last year, the numbers have grown and the 78 to open the series is an excellent start. "Considering past numbers, that number is just excellent," she said. "Even combining the two events and looking at last year when we first did it, this is the biggest we've had." ONE MILE (Under 9 & 11) Top Ten Boys: 1. Sam Potgieter, 6:41.2 (NR). 2. Charlie Potgieter, 7:10.5. 3. Kael Chalwell, 7:25.0, 4. Rush Broderick, 7:36.9. 5. Antonio Maduro, 7:40.6. 6. Latriel Williams, 7:41.6. 7. Jamal Harry, 7:51.3. 8. Adonijah Glasgow, 8:33.4. 9. Twarjha Jacob, 8:36.4. 10. Caleb Quayle, 8:54.3. Top Ten Girls:1. Khadija Samson, 6:54.2 (NR). 2. Olivia Quayle, 8:02.2, 3. Jahnear Frett, 8:30.5. 4. Martha Killourhy, 8:45.2. 5. Kassidy Penn, 9:00.3. 6. Mckenzie Crabbe, 9:34.8. 7. Asia McMaster, 9:44.7. 8. Angel Pickering, 10:00.9. 9. Taryn Augustine, 10:15.9. 10. Olivia Plaxton, 10:38.2. IMPORTANT NOTICE: ONLINE ALL POSITIONS ARE CORRECT, BUT ANY TIME SLOWER THAN 22:33.9 IS INCORRECT. Primary Schools Teams: Cedar School Primary (CS), Francis Lettsome Primary (FLPS), Joyce Samuel Primary (JSPS), Pelican Gate (PG), Willard Wheatley (WWPS) Top Ten: 1. Jahshani Farrington (FLPS), 17:40.4, 2. Jahnare Farrington (FLPS), 17:45.1, 3. M'Khori Crabbe (JSPS), 18:38.3. 4. Zolita Bamford (Cedar), 18:41.7. 5. Angel Beato (JSPS), 18:48.8. 6. Gethin Jones (Cedar), 21:40.9, 7. Kavon Wheatley (FLPS). 8. Kjornni Daniel (JSPS). 9. Makeda Gumbs (JSPS). 10. Anjeni Benjamin (JSPS). Points: 1. Joyce Samuel Primary, 35. 2. Francis Lettsome, 37. 3. Cedar Primary, 10 (2 participants). 4. Willard Wheatley, 27 (2 participants). 5. Pelican Gate, 11 (1 participant). Secondary Schools Teams: Cedar School (CS), Elmore Stoutt Carlisle House (C), St. Georges (St.G): Top Ten: 1. Liam Blok (CS), 16:42.3. 2. Sean Wong (CS), 18:34.1. 3. Tola Broderick (CS) 18:41.2. 4. Thomas Kyne (CS). 5. Za-riana Grant (CS). 6. Johannes Blok (CS). 7. Coco Osborne (CS). 8. Aria Creque (CS). Service Clubs: Rotaract Club (RC), Rotary of Road Town (RR), Rotary Sunrise of Road Town (RS), Rotary of Tortola, (RT): Top Ten: 1. Michael Killourhy (RT), 12:45.7. 2. Saungie Liburd (RC), 15:38.8. 3. Stacy-Ann Wynter (RT), 16:31.7. 4. Devon Letteen (RS), 16:51.5. 5. Shevon Williams (RC),17:21.2. 6. Henry Creque (RT), 18:07.2. 7. Warren Wintz (RT), 18:08.8. 8. Jude Noel (RC), 18:49.4. 9. Ryan Geluk (RR), 19:10.9. 10. Adenike Flax (RS), 19:53.9. Community Partners: BVI Swim Team (BVISWIM), Cedar School Parents/Teachers (CSPTA), Digicel (D), H. Lavity Stoutt Community College (HLSCC), Joyce Samuel Parent/Teachers (JSPTA), Montessori Parent/Teachers (MPTA), Peligan Gate Parent/Teacher (PGPTA)  Top Ten: 1. Kem Lake (PG PTA), 14:18.6., 2. Al Broderick (Cedar PTA), 14:29.2. 3. Juliane Potgieter (Montessori PTA), 15:21.0, 4. Kedrick Matthew (DIG), 15:31.2. 5. Jessica Broderick (Cedar PTA), 16:12.6 6. Kevin Carragher (DIG), 16:15.5. 7. Akeed Fahie (JSPTA) 16:56.7. 8. Anna Kinkead (Cedar PTA), 17:09.2. 9. Rhiannon Jones (Cedar PTA), 17:30.8. 10. Kurt Salapare (BVISWIM), 18:00.7. Points: 1. Cedar School PTA Team-1, 43. 2. Digicel, 74. 3. Pelican Gate PTA, 4. Joyce Samuel PTA, 111. 5. Montessori PTA, 52 (4 participant). 6. BVI Swim Team, 70 (4 participant). 7. Cedar School PTA Team-2, 35 (2 participants). 8. HLSCC, 20 (1 participant).